A seminar designed for clients desiring the highest level of pet obedience. The class meets off-site at fields and wooded parks, and culminates with a two mile off-leash hike. The Advanced Pet Seminar is outstanding for outdoor enthusiasts who wish to have their pet join them off-leash as they participate in running, hiking, picnics, ball games or other enjoyable outdoor activities. Skills taught: Off-leash stays with high time, distractions and distance, Off-leash recalls with high distractions and distance, including blind recalls, Off-leash walking with very high distractions and mulitple environments, Distance downs with very high distance. Requires the purchase of special training equipment necessary to safely prompt enforcement of commands while dogs are off-leash. $210 for four 90-minute sessions. 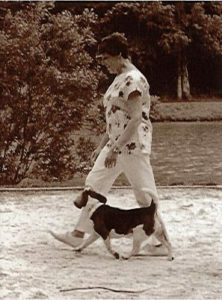 Advanced students Margee Hardee and Sherlock performing off-leash attention heeling. Who says Beagles aren’t trainable? All breeds enjoy training with CPT’s positive methods.